Be it a story or food – it is the sauce that matters! And finally, I found the courage and confidence to make mushroom pasta. I haven’t the courage to make pasta from dough-scratch but the sauce, I got! And the brilliant thing is that one needs just 4 ingredients to have this creamy, shining and delicious sauce. Salt and Pepper as you like ’em! 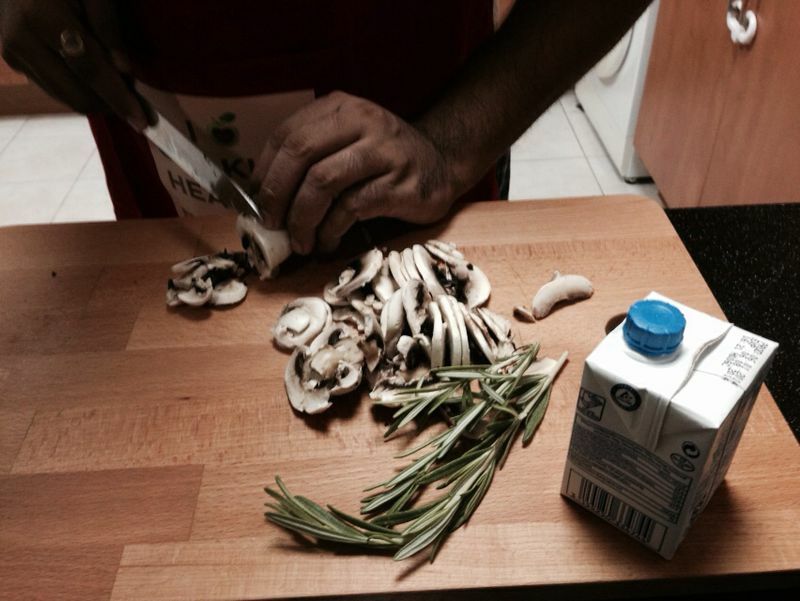 Prepping up for Mushroom Sauce! Sharpen up your knife and chop those red onions up finely. In case you are likely to cry a bucket, burn a candle before you start chopping. You will see the magic when you realise you are not welling up. Slice up the mushrooms. Keep aside. For the rosemary, hold ’em from the top and pull down the leaves with your thumb and fore-finger like a smooth swipe. You get only the leaves. Chuck the stem. Finely chop them up. Now, get your saucepan (the keyword is SAUCE) nice and hot with a drizzle of olive oil. Add in the onions and cook them till they are soft and pink. Add in the garlic then. This way, the garlic will not burn and the onions will not be undercooked. When you see them sweating it out in the sauce pan, add in the rosemary, give it a good stir and stop a while to enjoy the aroma! Once you are suitably intoxicated, slide in the chopped mushrooms. Cook them through. The mushrooms will half-out in the heat and by then you would have coated them well. Time for the seasoning. That done, dunk in your cooking cream and mix well. In case you notice that the concoction is too thick, use some cooking stock or simply use the pasta-boiling-water to loosen it a bit. It is now time for the pasta to take a dive into the delicious sauce. Drain them and put them straight in with the sauce. Mix well and ladle them on pasta plates. Top off with parmesan shavings! Enjoy! And remember – the magic is in the sauce! On my #Burp&Belch meter, I give it a shameless 5 burps (out of 5)! Modesty clearly doesn’t mix well with a good sauce!